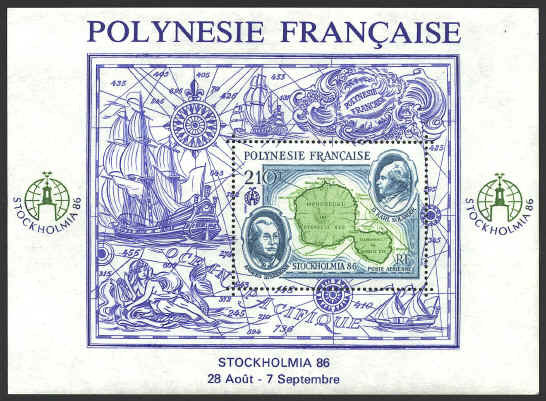 The souvenir sheet was issued by French Polynesia in 1986 to honor the work of two Swedish botanists, Daniel Karl Solander and Anders Sparrman at the world stamp exposition, Stockholmia '86. Sparrman's name is usually spelled with two r's and one "n." Occasionally the spelling with two n's is given in parentheses indicating that the usage is incorrect. On the souvenir sheet Sparrman's name is spelled with 2 r's and 2 n's.